I call warmups "Bellwork". I heard it once and thought it was cute. Bellwork - work you do when the bell rings. I am very strict about my beginning of class routine. My kids come in, check their homework, and start their bellwork. I'm "so mean" that I even expect them to start working before the bell rings (or so I've been told). Once their bellwork is finished, I'm usually ready to start class. It's a personal pet peeve when kids are noisy at the beginning of class. I also need to take attendance and check their homework. Kids walk in and pick up the key for the previous night's homework. They check their homework while I walk around and check it for completion. 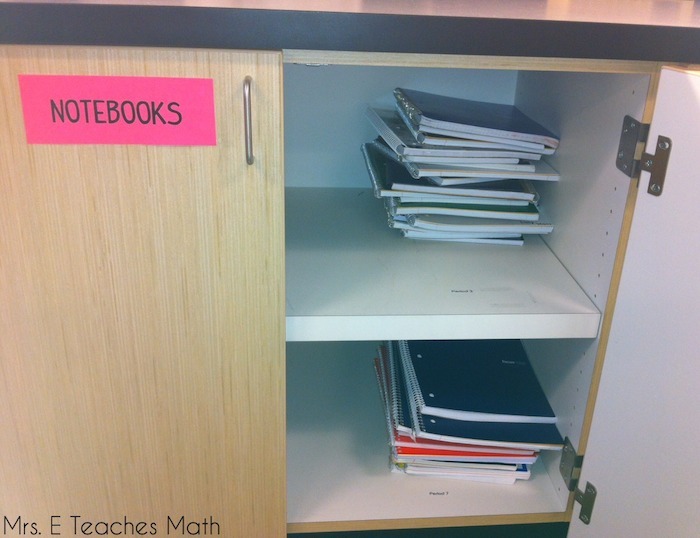 Then, the kids put their homework key away and get their notebook out of the cabinet. Then, they work on their bellwork and put away their notebook when they're finished. Since they start before the bell rings, they are totally done with this within the first 5-7 minutes of class. Sometimes, I plan for the bellwork to take a little longer so that I can give them review time. Other times, I make it very short so that we can get started as soon as possible. This works for me. It makes the beginning of every class smooth. 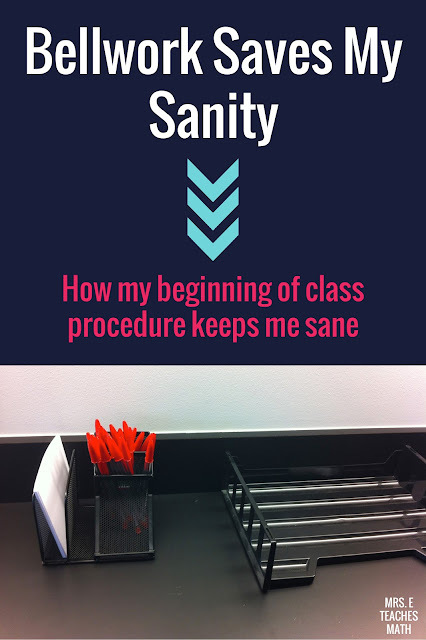 It gives me a mental "reset" if the previous class period was stressful. Bellwork. I'm a huge fan. What does your beginning of class routine look like? It's not a huge problem. It probably happens occasionally, but I walk around (drinking my coffee, LOL) while they're correcting and I eagle eye them. I don't have to stand in the hall between classes though, so my technique may not work for everyone. Also, I won't accept homework if they don't show their work and/or draw diagrams, so just copying the answers won't get them anywhere. If I do notice (or suspect) that they're just copying, I usually pull them aside and lay the guilt trip on thick. I usually say something like, "Whether you are or not...it *looks* like you're just copying the answers. I sure hope you wouldn't cheat by doing that. You would be doing a huge disservice to yourself, because you won't do as well on the test. Surely, that's not what you were doing though..."
One year, I did have a problem with students copying homework answers. So, for their homework assignments I gave them the problem and the answer for every problem. Their homework was to show EVERY step getting to the solution. We didn't check homework in class that year. 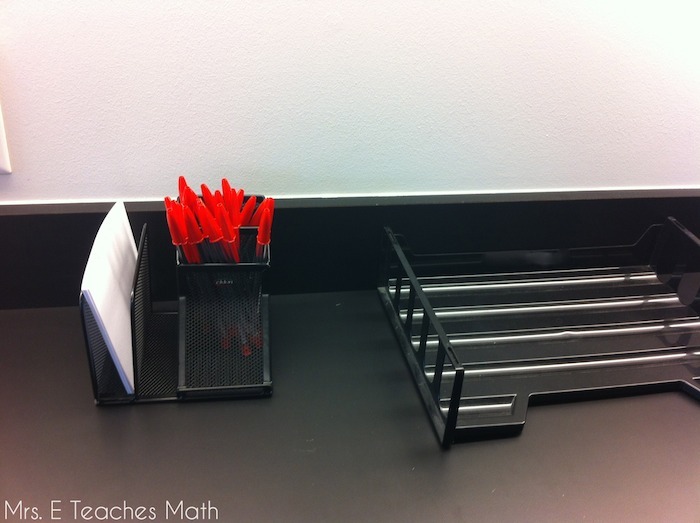 They would put it on their desk and I would walk around and spot check while they were working on their bellwork. My bigger problem is that I'm running through red pens like water this year. Last year, I bought 40 at the beginning of the school year and they lasted all year. This year, I bought 50 and I'm already down to 10. Seriously? I realize I'm late to the party here, but I wanted to chime in. I went through a RIDICULOUS number of pencils this past year. At the end of the year, I got tired of it and put hot pink duct tape flags on them, in which I wrote "I love Justin Bieber." The boys especially HATED using these pencils, and I kept more of the last 20 or so I flagged the last few weeks of school than I did the literal hundreds through the rest of the year. DeanDean2430, THAT IS AWESOME!!! I'm totally doing this! I LOVE IT! Thank you! I really try to be organized! I love the fact that you keep their notebooks so there's no excuses for not having them. I'm curious if you grade the bellwork, go over it later...wondering how you give your students feedback? I'm hoping to use this idea this year, especially the key to check homework answers idea. Bellwork is always a participation grade for me. Honestly, I just don't want to grade them all. I typically check their notebooks once per grading period and give them a participation grade based on the number of entries they have. Sometimes, their bellwork is something like "List the 5 theorems we learned yesterday." While not wonderful, it serves the purpose of having them get their notes out and looking over the previous day's material until I'm ready to start class. It's a good reminder. I don't ever go over those, because *hopefully* they have the answers staring them in the face. Sometimes, their bellwork is a practice problem or something. I usually go over those quickly or have a student put their work on the board. If I'm on top of it, I have the work all written out and I'll put it up right before I'm ready to start. Rarely do I go over individual homework problems in class. I only do it if it seems like the whole class needs it. They have online access to the solutions, so I just have them come to me with questions. So do they get a completion grade on their homework or do they turn the homework in and get a grade off of what they marked?